In April 1895, Oscar Wilde stood in the prisoner's dock of the Old Bailey, charged with "acts of gross indecency with another male person. These filthy practices, the prosecutor declared, posed a deadly threat to English society, "a sore which cannot fail in time to corrupt and taint it all." Wilde responded with a speech of legendary eloquence, defending love between men as a love "such as Plato made the very basis of his philosophy, and such as you find in the sonnets of Michelangelo and Shakespeare." Electrified, the spectators in the courtroom burst into applause. Although Wilde was ultimately imprisoned, the courtroom response to his speech signaled a revolutionary moment―the emergence into the public sphere of a kind of love that had always been proscribed in English culture. 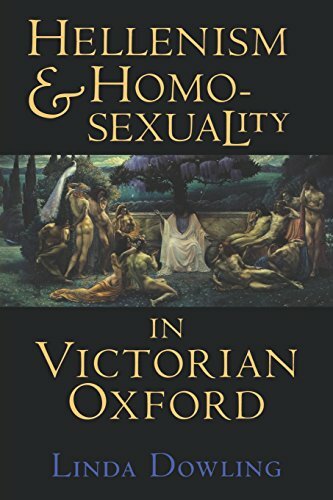 In this luminous work of intellectual history, Linda Dowling offers the first detailed account of Oxford Hellenism, the Victorian philosophical and literary movement that made possible Wilde's brief triumph and anticipated the modern possibility of homosexuality as a positive social identity. A homosocial culture and a language of moral legitimacy for homosexuality emerged, Dowling argues, as unforeseen consequences of Oxford University reform. Through their search in Plato and Greek literature for a transcendental value that might substitute for a lost Christian theology, such liberal reformers as Benjamin Jowett unintentionally created a cultural context in which male love―the "spiritual procreancy" celebrated in Plato's Symposium―might be both experienced and justified in ideal terms. Dowling traces the institutional career of Hellenism from its roots in Oxford reform through its blossoming in an approach to Greek studies that came to operate as a code for homosexuality. Recreating the incidents, controversies, and scandals that heralded the growth of Hellenism, Dowling provides a new cultural and theoretical context within which to read writers as diverse as Wilde, Jowett, John Addington Symonds, Walter Pater, Lord Alfred Douglas, Robert Buchanan, and W. H. Mallock. If you have any questions about this product by Brand: Cornell University Press, contact us by completing and submitting the form below. If you are looking for a specif part number, please include it with your message.